They are dark, mostly cold. Inevitable like the morning after, which usually comes like salvation. And even the most fearless of minds will feel uneasy when the watch's small hand fights its way through the upper right section of the dial in completely reduced light. NÄCHTE surrounds - at least at first sight - few positive things, they are (in New German) rather 'negatively occupied'. And yet - or for that very reason?! - they exert such a tremendous fascination. NIGHTS, they also stand for an invisible magnetism, a miraculous-hypnotic and unmeasurable force that hardly anyone can resist. nightshade plants and polar night, night patrol and starry night, night frost, night asylum, night express and so on. Terms picked up crosswise, and yet of a strange or eerie or tense restlessness radiating charisma. NIGHTS are always expectations, encounters with the unknown. What dreams do they give us? Who or what comes out of the darkness all of a sudden? Is anything going to happen? Uncertainty all around, the outcome of which can even decide on life: "We have to wait and see what the night brings", we hear doctors oracles, and fears, helplessness, the clinging to vague hopes infect us. NIGHTS were (and are) naturally always a topic for artists, for painters and composers, for writers and filmmakers. They have all made darkness the vehicle of their profession from time immemorial; they have all been and are all gripped by the night. One of Rembrandt's most famous paintings is 'Die Nachtwache' (1642), Wolfgang Amadeus Mozart created the Kleine Nachtmusik in 1787. Heinrich Heine formulated in 1844 "If I think of Germany in the night, I am deprived of sleep". The American writer Eugene O'Neill inspired in 1956 with the oppressive drama 'Eines langen Tages Reise in die Nacht' (A Long Day's Journey into the Night), which was written around 1940. A list without end, even with the moving pictures. In 1967, Sidney Poitier cast a spell over the moviegoers 'In the heat of the night', while his Hollywood colleague Jeff Goldblum threw himself 'headlong into the night' in 1985. Often - and who wouldn't feel it?! - it was already the titles that always spread a peculiar mood: In the early days of television, director Jürgen Roland captivated the 'Stahlnetz' TV community with the mysterious episode 'In der Nacht zum Ostersonntag'. Or we already felt anxiety when in 1957 and 1959, respectively, the posters for two German film classics (both of course in highly atmospheric black and white!) were hung up in the showcases of the Lichtspieltheater: 'At night, when the devil came' and, hardly to be surpassed in the naming, Frank Wisbar's 'Nacht fiel über Gotenhafen' (Night fell over Gotenhafen) - long a classic, just like 'Auf der Reeperbahn Nachts um halb eins' (Hans Albers, Heinz Rühmann, 1954). Especially in the 40s and 50s, imports from western countries also guaranteed quality. Paris at midnight' for example (England, 1949, with Jean Simmons and Dirk Bogarde) or the French films 'Wenn es Nacht wird in Paris' (Jean Gabin, Jeanne Moreau, 1954) and 'In ihrer Augen ist immer Nacht', a sultry 1958 thriller about a monastic student (Brigitte Bardot). There is no question that especially in those years the German Schlager also swam on this wave. He thus followed a good tradition, which had already originated decades before in many popular popular street hawkers: At night, when love awakens (by Jean Gilbert alias Max Winterfeld, 1913), I will dream of you every night (Friedrich Schröder, 1937), At night man does not like to be alone (Franz Grothe, 1944). When the conventional hit then dominated the charts here, the established lyricists took up the inexhaustible theme: Night and solitude, journeys through or into the night, nights in unknown places, frosty winter nights, uncanny encounters with strangers, mysterious voices in the night, only illuminated by pale moonlight. German hits as exclusively dark songs? As sounding carriers of grim creeps? Possibly as a guide to homemade depression? That couldn't, shouldn't and shouldn't be. The poetic ladies and gentlemen Busch, Hellmer, Hertha, Moderer & Co. therefore pulled out all the stops in order to skillfully balance any imminent imbalance. They let their thoughts wander as sensitively as unerringly over the illuminated globe: Bella Italia, the South Seas, picturesque, exotic places - all this came to the local listener, who (money was still scarce) could often only orient himself towards the Taunus or Timmendorfer Strand when planning his holidays. What could be more obvious than to offer people inexpensive three-minute trips over the Brenner with 45 revolutions? The lyricists tore up the uncomfortable, draining grey veil; sounding dreams and southern magic instead - with romantic starlit nights, contemplative evening hours for two by the sea, in idyllic harbours. Night, because that was hope, love, the glow of lights. And somewhere far out, a lovely serenade sounded, a quietly flattering guitar. Regardless of what the copywriters offered, they relied on foreign models for their creations, which they translated into German, or they created their own new creations, which at best became world hits. This compilation covers both categories. The classics of Bert Kaempfert and Lotar Olias are represented as well as transformed titles by US greats such as Don Gibson, Hank Williams and Kris Kristofferson. It's no coincidence that on this theme, the "beautiful singers" such as Ivo Robic, Freddy Quinn and Peter Alexander live up to their reputation as masters of melancholy. Foreign guests like Connie Francis, Eddie Constantine, Louis Armstrong or Esther Ofarim fit seamlessly into the programme with their songs. No wonder: After all, the night has no limits. 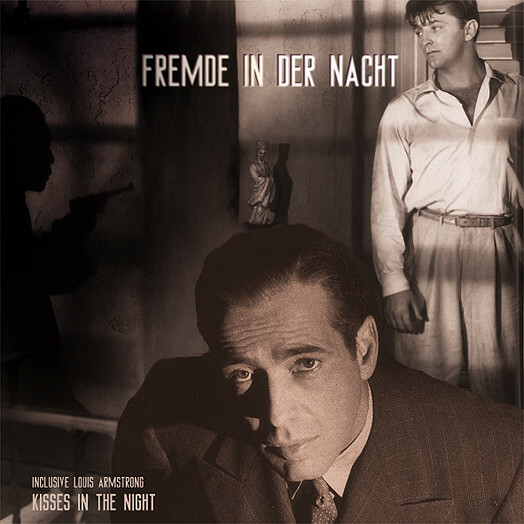 Customer evaluation for "Fremde in der Nacht (CD)"